Decreasing Collections – Stop Sending Patients’ Accounts to Expensive Collection Agencies. Insurance claims are rejected due to wrong diagnosis codes, wrong procedural codes, incorrect insurance information, and inadequate tracking of authorizations and referrals. REMEDY: Landmark has the experience and processing software to identify errors in advance resulting in a very small number of rejected claims. If a claim is rejected, it is handled on the day it is received by taking the necessary effort to resolve the problem and immediately resubmit the claim. Landmark can generally prevent ‘Lack of Authorization’ and ‘Lack of Referral’ rejections because they know which procedures and treatments require this documentation and it is included with the original insurance claim submission. 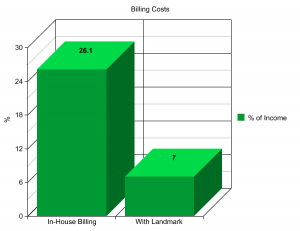 Billing services and departments bill patients for 60 to 120 days and then turn over inactive or slow accounts to collection regardless of the reason for the non-payment. The reasons could be valid and out of the direct control of the patient, such as Workmen’s Compensation, auto accident, incorrect addresses (patient not receiving the statement), and insurance rejections. Turning over these types of cases to collections reduces the amount paid to the care provider . . . it does not speed up payment. The patient, their attorney, and the pertinent insurance companies are contacted and lines of communication are opened up to help ‘move along’ the claim. The care provider is not charged any extra for this service. In regard to incorrect addresses, Landmark contacts each patient that is not paying to ensure that the address is correct and that the responsible party has received the bill. Payment is asked for and questions are answered. This step is very effective in getting the slow accounts settled. Insurance rejections sort themselves out because of Landmark’s expedient handling of the rejected claims. Rejections occur less frequently with our experience and attention to detail.